I was feeling rather blah yesterday, not up to the challenge of working on the coat, so I puttered around dyeing yarns instead.Â Then I realized that it wasn’t my mental alertness preventing me from working on the coat, but stark raving terror at the prospect of actually having to DO something with the pieces, as in PUT THEM TOGETHER.Â Up ’til now it’s all been preparatory work, tailor-basting the underlining to the fabric, tacking down interfacing, padstitching, fell-stitching, buttonholing, this, that, and the other.Â But no actual assembly of the fabric.Â Once I started assembling the fabric, I’d actually find out whether my design worked. As I said, stark raving terror. Upon realizing this, of course, there was only one thing to do.Â I sat down, ate a small bowl of ice cream (purely for medicinal purposes, you understand), and launched into the sewing of the seams. On the whole, I’m pleased.Â It has some flaws, e.g. the front part with the buttonholes is cut very slightly off-grain.Â Not enough to make a difference to the hang, as far as I can tell, but the yellow stripe near the buttonholes wanders into the buttonholes at the bottom.Â Oh well, c’est la vie.Â It is pretty clear to me, though, that with the strong vertical stripes of the Celtic-braid fabric, I’d darn well better get it precisely on-grain.Â Or it will show, and badly. I am pleased with the collar.Â It rolls smoothly around the neck, and precisely on the roll line.Â I am not so pleased with the lapels – I think I put the buttonhole too high, so it will not roll precisely on the roll line.Â But I will have to wait until I finish assembling the coat, to be really sure.Â One thing’s for sure: I am glad I am doing a practice coat before cutting into my handwoven! Wedding-dress-wise, I’ve decided to make a mockup of the pattern before the workshop.Â Considering how much work it is to weave up yardage, it’s only logical to make sure the cut is flattering before designing fabric for that pattern!Â Since it’s only a week and a half to the workshop, however, that means I need to act pretty quickly.Â So I will spend part of today cutting and sewing a muslin. The coat looks beautiful Tien. The collar is coming out really well and hopefully will surprise you and be fine in relationship to the top button hole. As a rule of thumb, when spacing buttonholes, I always make sure there is one right between the breasts, where the two halves of your bra connect, and then go from there. That prevents any gaping or pulling over the bustline. The buttonholes on the coat look like they are on top of and below the bustpoints. The coat is really pretty. I think it is going together well, and you’ve done an amazing amount of tailoring. 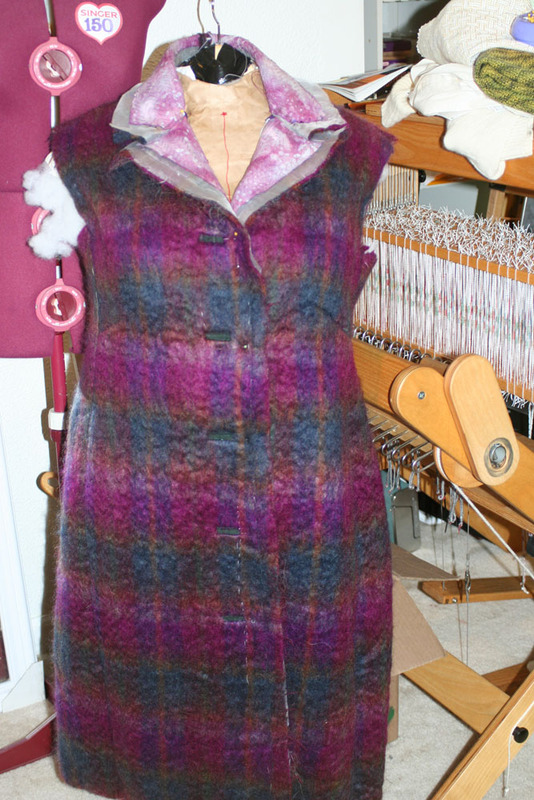 And all your work on the inside of the coat seems to be supporting the outer fabric well. 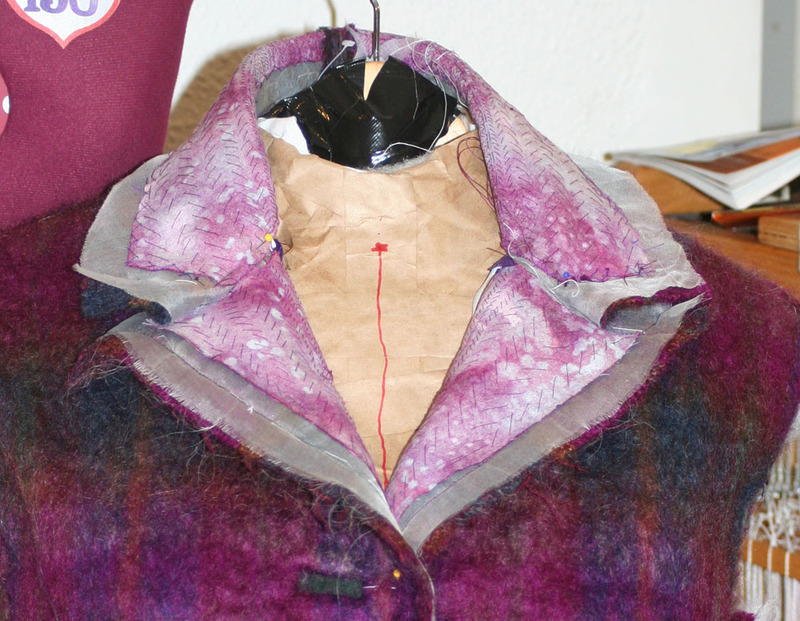 Once you have the upper collar on, and the sleeves, it will look like such a different coat. Actually, I was impressed at how your homemade dress form really makes the garment come alive. Enough so, that I am inspired to attempt to make one! Make a dress form, that is. Not a cashmere coat…yet. Ice cream is always my medicine of choice……….